[Click to Enlarge] When first I looked upon this Sykes slide I thought that it was most likely somewhere above Lake Chelan, and now after using – again – Googlecopter, it is confirmed. That Horace Sykes also drove his Chevrolet up the Shady Pass Road from the Entiat River valley means that he reached the lake from behind. Or did he? It is also possible to reach these heights from the other end of Shady Pass Road at the 25 Mile Creek on Lake Chelan, this means that it is roughly 2/5th of the way up the lake from Chelan to Stehekin. I doubt that it standard to ferry anybody’s Chevy up the lake to 25 Miles Creek, so I conclude – as introduced – that it is more likely that Horace got to this prospect from the south – from the Entiat side. I name the prospect Grouse Mountain because there’s a blue dot photo there that is captioned so. The highest point on Shady Pass Road is a few miles northwest of this prospect and it is considerably higher. This elevation is about 4,500 feet. The Pass and its campground around 6,600 feet. Lake Chelan is 1,102 feet above Puget Sound. If I have figured correctly the mountain seen far up the lake is Goods Mountain, the highest point in the North Cascades National Park, “the fourth highest non-volcanic peak in Washington, and the twelfth highest summit overall.” Quoting there from Wikipedia. Mt. Goods has this added mystery. In spite of it height, Goods cannot be seen from any highway. It rests in a sublime boudoir surrounded by attendant (or at least watchful) peaks that reach heights nearly its own. 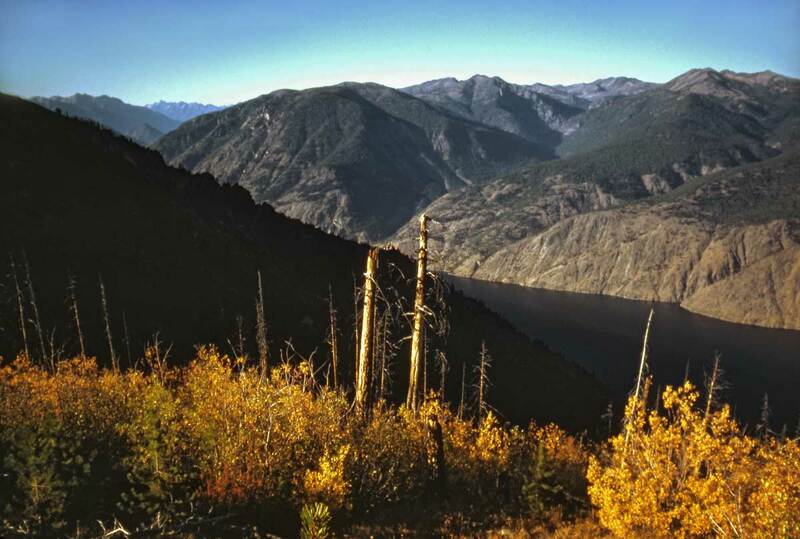 Together they are not a massif – like the Wallowas in northeast Oregon – because this range continues on to all sides far beyond park boundaries . Previous PostOur Daily Sykes #77 – Palouse PicturesqueNext PostThis Place Matters – the Video! You have some great images of the Lake Chelan Valley! I invite you to enter our Photo Contest. First place is $300 cash, 2nd is $200 and 3rd is $100. The details are here: http://www.cometothelake.com/369.html – you can submit 3 of your best!